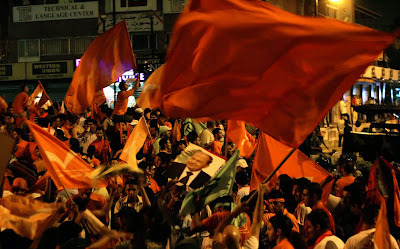 Observers of the Lebanese elections could not have failed to notice the tensions arising within the ‘Free Patriotic Movement’ (FPM/Tayyar) led by General Michel Aoun in the build up to the 7th June. Having kept us guessing for weeks the General finally released the names of his candidates for the key electoral districts of Jezzine, Baabda and Kesrwan. The reform and change bloc new line up in the Christian heartland of Kesrwan, a Aounist stronghold since the 2005 elections, is noticeable by its lack of change. All the indications are that the opposition list will perform well in this district with only limited possibility of a challenge from a disparate cohort of local politicians with little to offer than a return to the stale and uninspiring pre-2005 situation. A number of accusations and rumours preceded the announcement, the latest being from controversial editor of Ad-Diyar daily Charles Ayyoub who claimed that a number of financial transactions in Aoun’s favour influenced his final choice of candidates. The disappointment comes also from within the Tayyar, as described by inside sources to El-Nashra. In effect, the unchanged list denies any new faces coming from the ranks the chance to genuinely establish a legacy within the area. Instead Aoun chose a more reliable alliance of loosely connected traditional personalities who operate under the umbrella of the Reform bloc. Candidate Nader Mrad, a Tayyar activist was the first victim of this course of events. He, who until a few days before was still insisting that he had the backing of his party, had to accept that electoral priorities came first. A similar picture had emerged in Beirut district 1 where long time student activist Zia Abs was originally mentioned only to be dismissed in favour of Abou Jamra, a veteran Aoun right hand man from 1989 but with little charisma and well past his expiry date. The battle of Baabda even held more hopes for the Tayyar rank and file to challenge the norms of Lebanese politics and be represented by a non-Christian. Ramzi Kanj, Shiite and party member has been a rising star over the past 2 years, was sacrificed on the altar of an agreement with Hezbollah that followed a disagreement with the Amal movement of Nabeeh Berri in Jezzine. It is true that the FPM has fielded in the same district Alain Aoun, another young Turk with a promising future. But Aoun is the general‘s nephew and cynics might argue that the family connection trumps the reformist credentials of the young Aoun. My impression is further confirmed by browsing at the faces of the remaining candidates on the movement’s website; Mostly suited men in their 50s in keeping with the long held image of the Lebanese politician. Gilberte Zwayn, hardly a feminist icon, is left to represent 50% of the Lebanese population rendering the Tayyar’s advertising campaign (Sois belle et vote / Be pretty and vote) even more ironic. Regardless of my prejudices against the Aounist interpretation of history, one could at least see glimmers of hope for the emergence of a genuine secular political party that would stimulate a battle of ideas on the national level. And while the 14th March tenors of the Cedar revolution seem to have already abandoned any pretentions of reform ; the elections, won or lost, might relegate the FPM to just another self-serving tribe. In the silent struggle between the (Free Patriotic) movement and the (Reform and Change) bloc, it is certainly the latter that comes out on top... unfortunately for everyone. In your opinion - What should be done from a judicial standpoint and/or constitutional standpoint to allow for better opportunities for individuals to be voted in office as opposed to voting for a bloc made out of odd political bedfellows. Of course, taking into account that winning is their ultimate goal, not just the principle of running. This is a good question Marwan. And not one that can be answered without drawing on experience of reform from other countries. Also the internal democratic process within the FPM is to be questionned. The General seems to be the alpha and the omega with regards to most decisions. Is that part of a reformist agenda? But to answer your question.On a broader level when it comes to institutional reform I am for proportional representation. And this should be a priority for the following 4 years. This is one simple suggestion and I am sure 2 or 3 of these will suffiece to create a dynamic of change in Lebanon. Well if he says he's not cheating on his wife, doesn't mean he won't. It just means the circumstances didn't allow for that to happen. Regardless, my question was not regarding Mr. Aoun in particular. I am not a big fan of slogans and/or unrealistic goals in politics. Mr. Aoun and his party are merely paying lip service when they talk about fighting corruption. Being in the opposition, they can talk the talk, and the good news is, they don't have to walk the walk. If you ask me, Mr. Aoun's popularity will only be tested when he is perceived as a major player not the underdog. With that said, I'm not very clear on how the proportional representation work? P.S. Do you have a view on who among Lebanon's current political players is worthy of attention, let alone respect? I know you attach the March 8 alliance quite often, but it's unclear to me whether you have an opinion about March 14 with regards to what went right and what went wrong, as well as who you think is a good leader in Lebanon. I couldnt agree with you more on this one. That is a key point to understand the connection Aoun maintains with the Christian electorate who consider themselves the loosers of the post-Taef era. But try explaining this point to the Hariri clan who have dug their own hole by emasculating their allies. We might just be culturally programmed to view all issues from the prism of personnal and/or private gain. Perhaps a good reason why we succeed superbly in business and private careers but fail miserably to govern and meet the needs of multitude? I'm a tayyar member, and I do like to say an alternative class of leaders take over. It's true that every Lebanese party runs the risk of having new principles be negated by some old middle eastern reflexes, like family ties and old age trumping a person's qualifications. However, I think it's a grass root effort that would prevent that. The FPM's think tank in 2005 showed the potential of the newer generation in Lebanon. Made of successful entrepreneurs and professionals, these have written guidelines of how to manage Lebanese as intelligently as we managed our companies. If the old ruling class is not ready for that yet, then the think tank can take these ideas to the people. Change, after all, is realized from the ground up. As an example, environmentalism exists in the west because scientists presented their case to the government, and were ignored. They then took their case straight to the public, educated the public opinion, and that it its turn influenced governmental policies. Same can happen in Lebanon. We have all the brilliant minds we need, they can use they internet which is trumping traditional media world-wide to educate the public. As a consequence, politicians, in and out of FPM, will have to follow suit. It's the populist approach. Now as to your “prejudice against the Aounist interpretation of history”, I always thought that this was not your issue but rather style and sometimes inconsistency!? Although, and for the record, I personally have no issues with their interpretation nor with their style or consistency. Cheers and again, Great Blog! Thanks for both comments above. First I would just like to point out that this is the level of discussion that is needed in Lebanon and in the broader Arab world. Unfortunately you only have to visit any forum or group where you have more than one opinion expressed to witness the decay of our democracy. Second. As Nabih knows I am willing to give the Tayyar credit on certain issues although I have issues with the Aoun leadership and I am ideologically on the Left. But this is an open ended discussion to follow at a later point. Ultimately 'the proof is in the pudding' as the British say. Only when tried and test that will be able to judge the Tayyar on action not slogans. This might happen sooner than we though judging by the performance of the majority. Joseph, i loved your depiction of Gilberte Zouein! I've been debating for weeks whether to vote for her or not on June 7. Indeed, the ironic 'sois belle et vote' campaign would seem to work better for someone like Nayla Teuini, and Zouein, renowned for her silence, is not convincingly feminist. However, given the almost obscenely limited choice keserouan voters have- that newly hatched march 14 ticket is just nefarious in being so unwisely/stubbornly belated and, more importantly, a poorly focused regurgitation programwise (as well as incongruous for bringing together such a fantastic array of patriarchs)- i would rather vote for Gilberte, who, incidentally, had been electorally snubbed/swindled by the latter since 1990, and not risk having someone from the opposite camp make it to parliament. It is true that the General M.A. himself might in many ways be construed as patriarchal- not that the majority of his opponents aren't- but, at least on his Keserouane district ticket, the individual candidates do not seem to be as offensively self-seeking as their opponents (for eg., it might be a sweeping statement, but I can’t imagine but the gullible, the patently misguided, or the illiterate being mobilized to vote for Mr. Charles Ayyoub or Mr. Ghanem Bon) and are more likely to remain united after their re-election, thus potentially able to achieve some kind of would-be change or reform stalled in different ways when they were still a parliamentary ‘minority’, rather than coalesce temporarily for one day and go on their own tangents afterwards. I say let the opposition win, and then note if what you described as their "battlecry" of change/reform concretizes its increasingly persistent audibility into a chain of fruitful actions on which we'll base our electoral choices in 2013. Well. What we have in common is that we both vote in Kessrwan.Except that as an expat I will be denied the chance to express my opinions in the ballot box. Going back to Kessrwan I dont see much difference between a Neematallah AbiNasr and a Mansour ElBon to be honest. As for Charles Ayyoub, he clearly has issues. Good luck in your choices. Maybe your predictions will be more accurate than mine.